Courtesy Running Press / "Rock Your Ugly Christmas Sweater"
Candy cane, anyone? Nothing like matching sweaters for the annual holiday family photo. When Anne Marie Blackman isn’t attaching Christmas lights to unsuspecting knits, she’s sewing on furry Santas and searching for the tackiest, boldest, over-the-top vintage holiday wear she can find. It’s ugly Christmas sweater season and her customers are in a frenzy to buy. One of her most outrageous offerings this year? A sweater with giant coils coming out of the chest area – think Madonna’s cone bra – with ornaments dangling at the end. It’s sold out, as are many of her designs. Blackman’s website has had more than 5 million page views so far this holiday season. Although she doesn’t give out specific sales numbers, Blackman estimates that she sells thousands of sweaters each year. “It’s crazy popular,” she said. So why are so many people willing to plunk down their hard-earned money during hard economic times for something so tacky? This holiday sweater deserves two thumbs up. 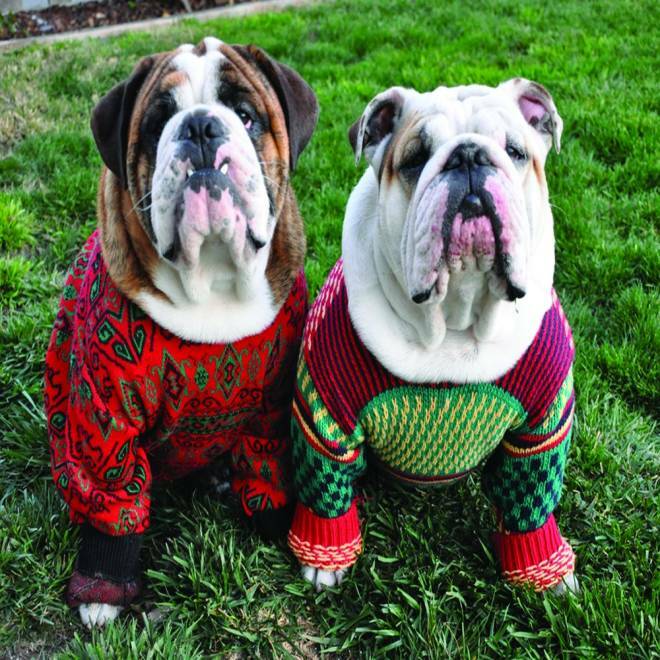 Wow, who even knew you could buy ugly holiday sweaters for dogs? Many buy the sweater for the social connection, said Kit Yarrow, a consumer research psychologist and chair of the psychology department at Golden Gate University. “You are wearing something that other people want to talk about, which then gives people a reason to talk to you. It makes you seem kind of big-hearted in a way, that you’re willing to wear an ugly sweater for other people’s amusement,” Yarrow said. “I’ve known people who have spent $250 on one of these sweaters. Those are people I would call, 'All in.' "
Then, there’s the satire factor. College-age consumers love irony, Yarrow has found in her research, so wearing such jaw-dropping fashion is a good-natured way to mock the world, she said. “It’s actually sort of a charming thing, as much as we mock it,” Yarrow added. 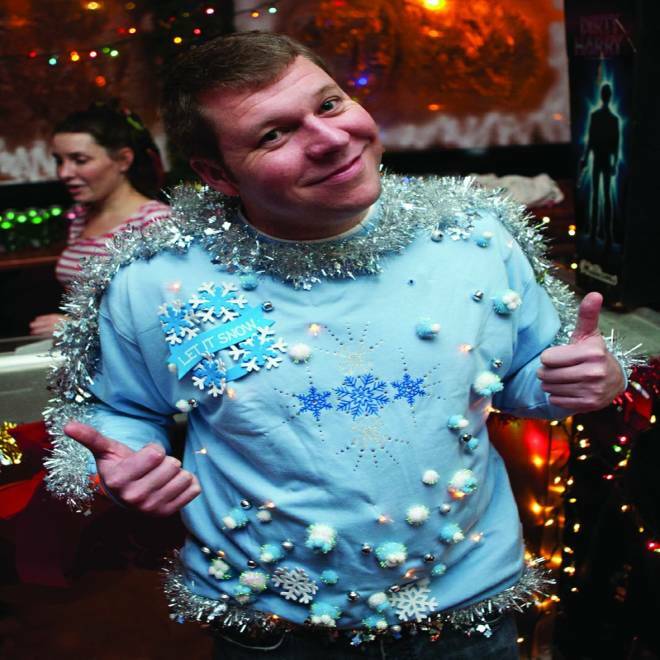 Adam Paulson – who together with two friends runs UglyChristmasSweaterParty.com – attributes the trend to the exploding popularity of parties that require guests to wear obnoxious holiday knits. The celebrations first began about a decade ago as college students made fun of their parents’ fashions from the 1980s, Blackman and Paulson said, but then evolved into events involving all ages. The ugly Christmas sweater theme is now common at office parties, fundraisers and family get-togethers. There are even online tutorials on how to add an iPad fireplace to your outfit to help you stand out. UglyChristmasSweaterParty.com began as an Indiana-based blog, but emails began pouring in from people trying to find the featured sweaters. So in 2009, Paulson and his partners, Brian Miller and Kevin Wool – who call themselves "Team Ugly" – began making the rounds at Goodwill stores to find knits they could sell. Each sweater was given a silly name, like “Ryan Treecrest,” and the business took off. Business is booming, but the competition “has just gone through the roof,” Paulson said. Blackman recalled that when she first started listing her sweaters on eBay, there were about 3,000 for sale. 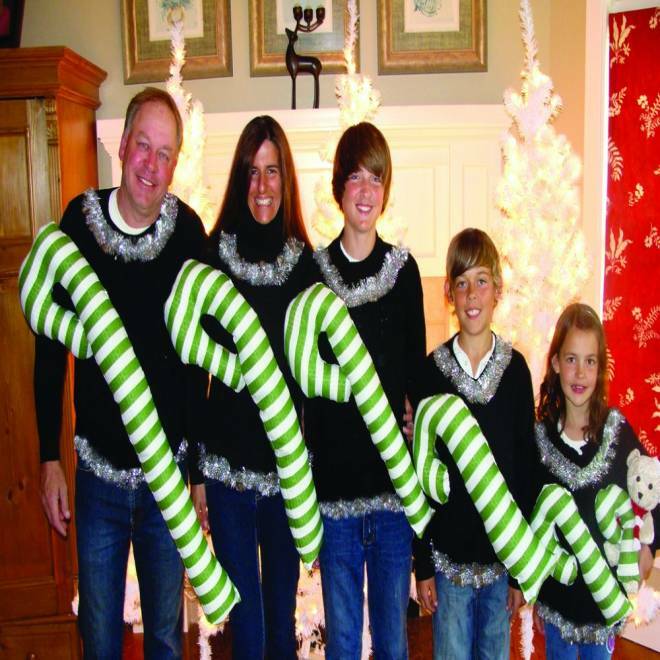 Today, a search for “ugly Christmas sweater” on the site yields almost 35,000 results. “(The trend) has a lot of legs to it. I think it’s going to go on for some time,” she said.